State the norms of Bharat stage III and IV. In year 2010 – Bharat Stage III Emission Norms for 2-wheelers, 3-wheelers and 4-wheelers for entire country whereas Bharat Stage – IV (Equivalent to Euro IV) for 13 major cities for only 4- wheelers. Bharat Stage IV also has norms were implemented for 4-wheelers for 13 major cities for only 4-wheelers. Currently, BS-IV petrol and diesel are being supplied in whole of Northern India covering Jammu and Kashmir, Punjab, Haryana, Himachal Pradesh, Uttarakhand, Delhi and parts of Rajasthan and western UP. The rest of the country has BS-III grade fuel. The following data refers to a trial conducted on 4-stroke petrol engine Air-fuel ratio (by mass) = 15.5 : 1 Heat value of fuel = 48000 kJ/kg Mechanical efficiency = 82% Air standard efficiency = 54% Relative efficiency = 70% Volumetric efficiency = 80% Speed = 240 rpm Brake power = 75 kW Calculate : i) Compression ratio ii) Indicated thermal efficiency iii) Brake specific fuel consumption. A petrol engine has a cylinder of diameter 60 mm and stroke 100 mm. If the mass of charge admitted per cycle is 2×10  4 kg. Find volumetric efficiency of the engine. Explain with neat sketch two way catalytic converter. C) Catalytic Convertor: -. A catalytic converter is cylindrical unit about the size of small silencer and is installed into exhaust system of vehicle. It converts the harmful gases from the engine into harmless gases and escapes them into atmosphere. Inside converter there is honeycomb structure of ceramic or metal which is coated with alumina base material and therefore a second coating of precious metal platinum, palladium or rhodium or combination of same. As a result of catalytic reaction, the exhaust gases pass over the converter substance, the toxic gases such CO, HC and NOx are converted into harmless CO2, H2 and N2. Two way catalytic converter: Through catalytic action a chemical changes converts carbon monoxide (CO) and hydrocarbon (HC) into carbon dioxide (CO2) and water (oxidation)..
a) Define : i) Stroke ii) Bore iii) Piston speed iv) MEP (Mean Effective Pressure). 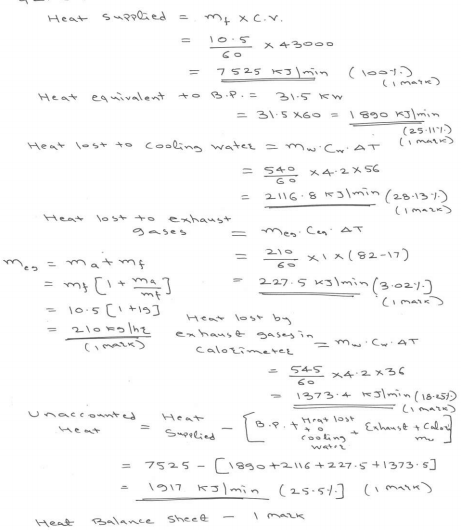 Explain how the heat balance sheet for an IC engine is prepared ? The following results were obtained during Morse test on 4 stroke petrol engine Brake power developed when all cylinders are working = 16.2 kw Brake power developed with cylinder no. 1 cut off = 11.5 kw Brake power developed with cylinder no. 02 cutoff = 11.6 kw Brake power developed with cylinder no. 03 cutoff = 11.68 kw Brake power developed with cylinder no. 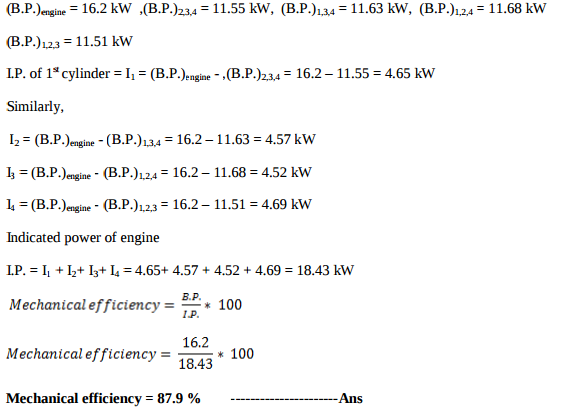 04 cutoff = 11.5 kw Calculate mechanical efficiency of the engine. The following results were obtained during Morse test on 4-stroke petrol engine. Brake power developed when all cylinders working = 16.2 kW Brake power developed when 1 st cylinder cutoff = 11.5 kW Brake power developed when 2 nd cylinder cutoff = 11.6 kW Brake power developed when 3 rd cylinder cutoff = 11.68 kW Brake power developed when 4 th cylinder cutoff = 11.57 kW Calculate mechanical efficiency and friction power. State the advantages of lubricant additives (any four). (i) Indicated Power: The total power developed by combustion of fuel in the combustion chamber is called indicated power. (ii) Brake Power: The power developed by an engine at the output shaft is called brake power. (iii) Volumetric efficiency: It is defined as the ratio of the actual volume of the charge admitted into the cylinder to the swept volume of the piston is known as volumetric efficiency. L = stroke length in m.
(ii) Swept Volume (VS) w.r.t. Reciprocating air compressor: It is the actual volume of air taken in during suction stroke. It is expressed in m3 . Swept volume when expressed in m3 /min, it is known as piston displacement. What is meant by catalytic converter ? Briefly explain with the help of neat sketch. harmless gases. Catalytic converter is used in exhaust emission in control system to convert CO, NOx, HC and other harmful gases to harmless gases. A Catalytic converter consists of a cylindrical unit of small size like a small silencer and is installed into the exhaust system of a vehicle. It is placed between the exhaust manifold and the silencer. Inside the cylindrical tube i.e. converter there is a honey comb structure of a ‘ceramic or metal’ which is coated with ‘alumina base’ material and there after a second coating of precious metals ‘platinum, palladium or rhodium’ or combination of the same. This second coating serves as a catalyst. A catalyst is a substance which causes a chemical reaction intro the gases. When the exhaust gases pass over the converter substance, the toxic gases as CO, HC & NOx are converted into harmless gases as CO2, H2 & N2. List out different pollutants in exhaust gases of petrol and diesel engine ? Briefly explain theireffects on human beings and environments (atleast four). The major air pollutants emitted by petrol & diesel engines are CO2, CO, HC, NOx, SO2, smoke & lead vapour. hemoglobin ,which reduces oxygen carrying capacity of blood.  This leads to laziness, exhaustion of body & headache.  Prolong exposure can even leads to death.  It also affects cardiovascular system, thereby causing heart problem Effect of CO2: Causes respiratory disorder & suffocation. Effect of NOx: It causes respiration irritation, headache, bronchitis, pulmonary emphysema, impairment of lungs, and loss of appetite & corrosion of teeth to human body. Effect of HC: • It has effect like reduced visibility, eye irritation, peculiar odour & damage to vegetation & acceleration the cracking of rubber products. • It induce cancer, affect DNA & cell growth are know a carcinogens. Effect of SO2: It is toxic & corrosive gas, human respiratory track of animals, plants & crops. Explain in brief, how ‘Morse test’ is carried out ? First engine is allowed to run at constant speed and brake power of engine is measured when all four cylinder working. 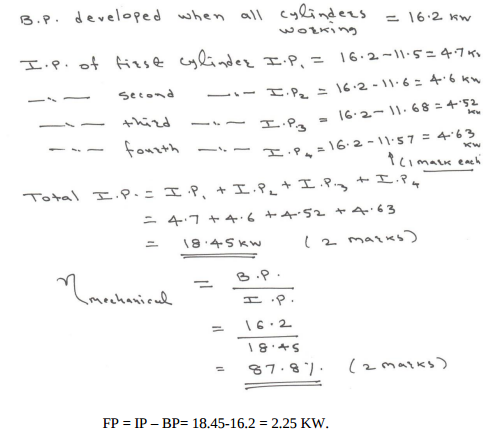 (IP1 + IP2 + IP3 + IP4) = (BP) 1234 + (FP) 1234 Where, IP- indicated power. BP – brake power develop. FP – frictional power. 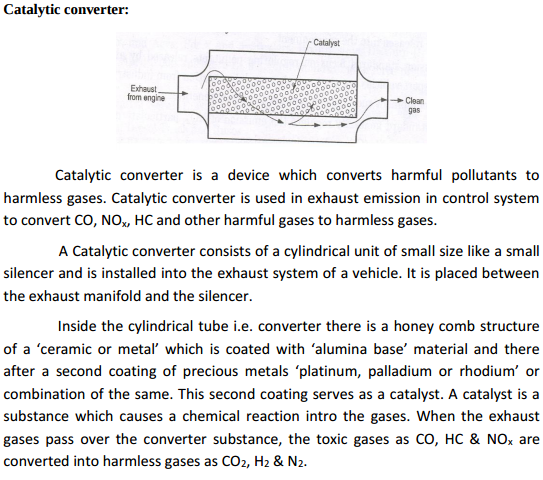 Explain with neat sketch the constructional features of ‘Three Way Catalytic Converter’. 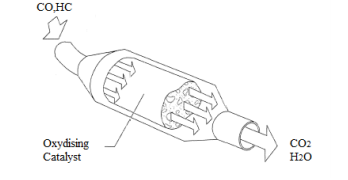 - Three way convertor uses thin coating of platinum, palladium and rhodium over a support metal (generally alumina) & acts on all three major constituents of exhaust gas pollution i. e. hydrocarbons, carbon monoxide & oxides of nitrogen, oxidizing these to water, carbon dioxide & free hydrogen & nitrogen respectively. - It operates in two stages, the first convertor stage uses rhodium to reduce the NO2 in the exhaust into nitrogen & oxygen. 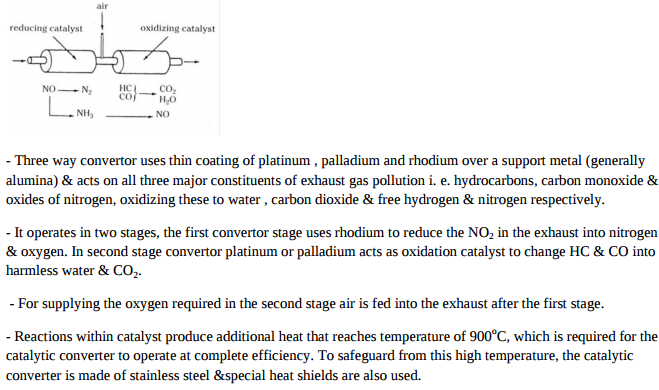 In second stage convertor platinum or palladium acts as oxidation catalyst to change HC & CO into harmless water & CO2. - For supplying the oxygen required in the second stage air is fed into the exhaust after the first stage. - Reactions within catalyst produce additional heat that reaches temperature of 900oC, which is required for the catalytic converter to operate at complete efficiency. To safeguard from this high temperature, the catalytic converter is made of stainless steel &special heat shields are also used. Following observations were made during a trial on 4-stroke, single cylinder engine running at 240 rpm having brake wheel diameter 1.5 meter. Duration of trial 30 min. Fuel consumption 6 liter C.V. of fuel 42000 kJ/kg Sp. gravity 0.8 IMEP 550 kPa Brake load 150 kg Spring balance reading 15 kg Cylinder diameter 30 cm Stroke length 45 cm Jacket cooling water 11 kg/min Temp. rise in jacket water 36°C Determine : i) I.P. and B.P. 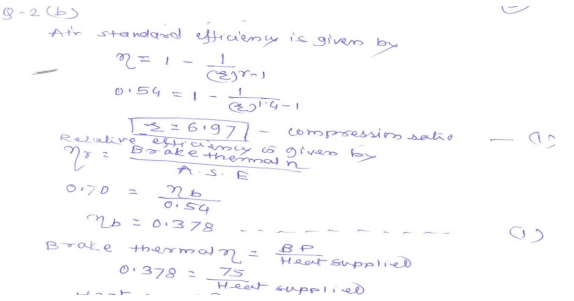 ii) Heat balance sheet on percentage basis. An engine has piston diameter 15 cm, length of stroke 40 cm and mean effective pressure 5 bar. Engine makes 120 power strokes per minute. Find mechanical efficiency if brake power is 5 kW. Explain the term w.r.t. I.C. engine. i) Mean Effective Pressure (MEP) ii) Cut off ratio. ( i ) Mean effective pressure – Defined as the average pressure acting on the piston which will produce the same output as is done by the varying pressure during the cycle. ( ii ) Cut off ratio – Fuel is injected into combustion chamber where only air compressed and is at high temperature. Fuel is injected for a duration of time, say T. The piston would not have reached the bottom dead centre in time T. The fuel is cut off when the volume is, say V2. The clearance volume is V1. The ratio V2/V1 is cut off ratio. (1) Detergents – To keep engine parts, such as piston and piston rings, clean & free from deposits. (2) Dispersants – To suspend & disperse material that could form varnishes, sludge etc that clog the engine. (3) Anti – wear – To give added strength & prevent wear of heavily loaded surfaces such as crank shaft rods & main bearings. (4) Corrosion inhibitors – To fight the rust wear caused by acids moisture. Protect vital steel & iron parts from rust & corrosion. (5) Foam inhibitors – control bubble growth, break them up quickly to prevent frothing & allow the oil pump to circulate oil evenly. (6)Viscosity index improver – added to adjust the viscosity of oil. (7) Pour point depressant - improves an oil ability to flow at very low temperature. A four cylinder engine running at 1200 rpm delivers 20 kW. The average torque when one cylinder was cut is 110 N.m. Find the indicated thermal efficiency if the calorific value of the fuel is 43 MJ/Kg and the engine uses 360 gm. of gasoline (fuel) per kW. hr. Explain with neat sketch working of non dispersive infra red (NDIR) gas analyser. Non dispersive infra red gas analyzer ( NDIR) : The working principle of infra red gas exhaust gas analyzer is as shown in figure . It works on the principle of hetero atomic gases absorbs infra red energy at distinct and separated wavelength. The absorbed energy raises the temperature and pressure of confined gas. This enables to measure contents of hydro carbon and carbon monoxide. This is a faster method of gas analysis. The standard sample is filled in reference cell R . the sample of gas under testing is filled in cell S . The detector cell D is filled with specific gas to be measured, say CO2 . the detector cell is divided into two compartments by diaphragm. It is very sensitive. Initially infra red energy in both compartment is same and indicator reading is zero. The sample is connected to exhaust gas. This lowers pressure on sample side. It will absorb energy in proportion to concentration of CO2 in sample and detector gives percentage of CO2 present in the samp0le. A four stroke gas engine has a cylinder diameter of 25 cm and stroke 45 cm. The effective diameter of brake is 1.6 m. The observations made in a test of the engine were as follows. Duration of test = 40 min. Total no. of revolutions = 8080 Total no. of explosions = 3230 Net load on brake = 90 kg Mean effective pressure = 5.8 bar Volume of gas used = 7.5 m3 Pressure of gas = 136 mm of water Atm. temp. 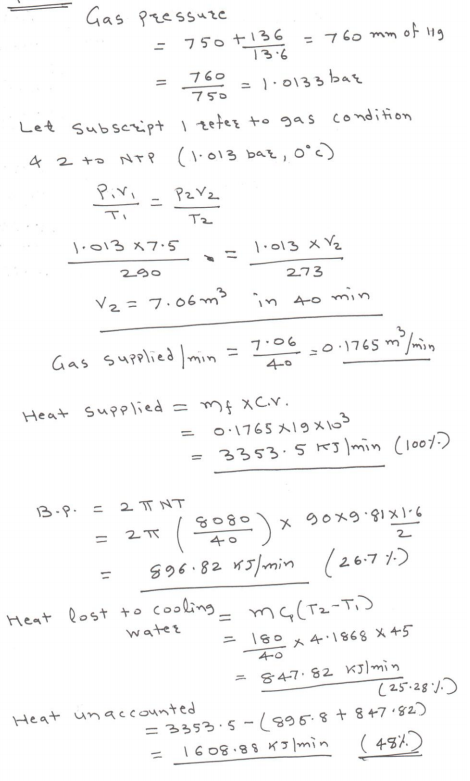 = 17°C Calorific value of gas = 19 MJ/m3 at NTP Rise in temp. 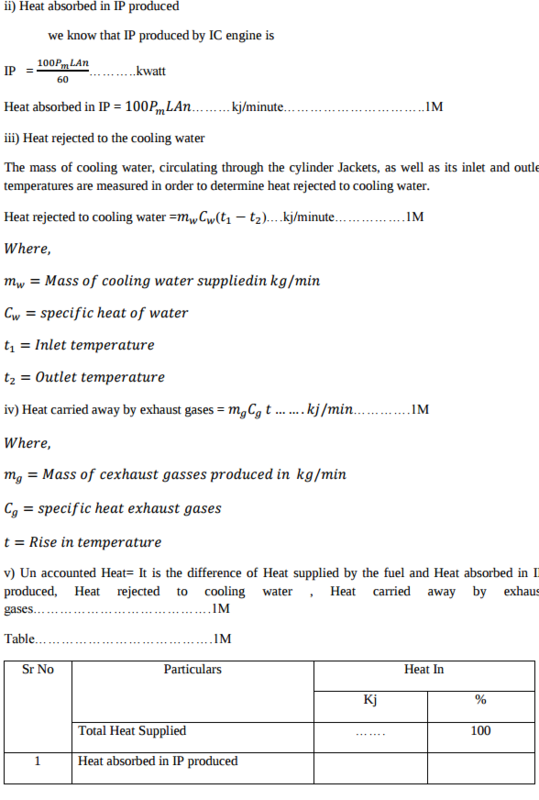 of jacket cooling water = 45°C Cooling water supplied = 180 kg Draw heat balance sheet and estimate indicated thermal efficiency and brake thermal efficiency. Assume atmospheric pr. as 760 mm of Hg. List any four pollutants in exhaust gases of I.C. engine with their effects. The major air pollutants emitted by petrol & diesel engines are CO2, CO, HC, NOx, SO2, smoke & lead vapour. Effect of CO:  Carbon monoxide combines with hemoglobin forming carboy hemoglobin ,which reduces oxygen carrying capacity of blood.  This leads to laziness, exhaustion of body & headache.  Prolong exposure can even leads to death.  It also affects cardiovascular system, thereby causing heart problem Effect of CO2: Causes respiratory disorder & suffocation. Effect of NOx: It causes respiration irritation, headache, bronchitis, pulmonary emphysema, impairment of lungs, and loss of appetite & corrosion of teeth to human body. Effect of HC: • It has effect like reduced visibility, eye irritation, peculiar odour & damage to vegetation & acceleration the cracking of rubber products. • It induce cancer, affect DNA & cell growth are know a carcinogens. Effect of SO2: It is toxic & corrosive gas, human respiratory track of animals, plants & crops. CO emissions are Carbon Monoxide emissions are are more evident in Petrol engines. Long Term exposure can prevent oxygen transfer and increase headaches/nausea. HC emissions are Hydrocarbons which are again more prevalent in Petrol engines. Short term exposure can cause headaches, vomiting and disorientation. NOx emissions are Nitrogen Oxide emissions which are more prevalent in Diesel engines. Long Term exposure can cause Nose and eye irritation and damage lung tissue. PM is Particulate matter, again more prevalent in a Diesel engine. Long Term exposure can harm the respiratory tract and reduce lung function. 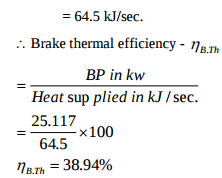 iii) B.S.F.C: It is the weight of fuel required to develop 1KW of the brake power for period of 1 hour. 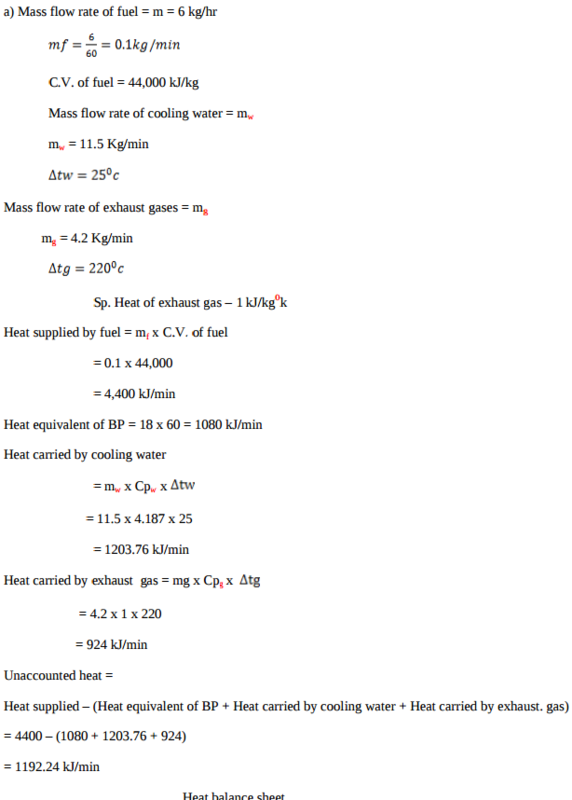 Unit of B.S.F.C is Kg/KW h. It is defined as the amount of fuel consumed per unit of break power developed per hour. What is the necessity of I.C. Engine Testing ? What are the different test carried out on I.C. Engines ? Explain the procedure for conducting Morse test. An I.C. Engine uses 6 kg of fuel having calorific value 44000 kJ/kg in one hour. The IP developed is 18 kW. The temperature of 11.5 kg of cooling water was found to rise through 25°C per minute. The temperature of 42 kg of exhaust gas with specific heat 1 kJ/kg°k was found to rise through 220°C. 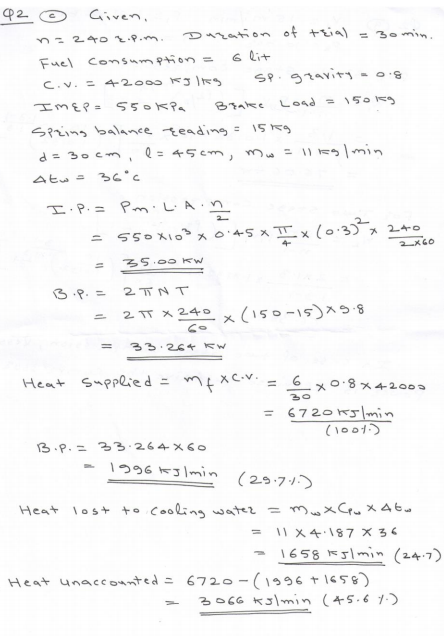 Draw the heat balance sheet for the engine. Explain three way catalytic convertor. What are the effects of pollutants on environment ? The following results were obtained during Morse test on 4-stroke petrol engine. B.P. developed when all cylinders are working = 16.2 kW. B.P. developed when cylinder No. 1 cutt off = 11.55 kW. B.P. developed when cylinder No. 2 cut off = 11.63 kW B.P. developed when cylinder No. 3 cut off = 11.68 kW B.P. developed when cylinder No. 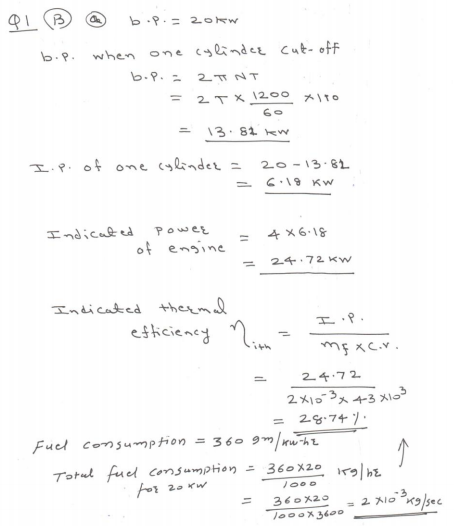 4 cut off = 11.51 kW Calculate mechanical efficiency of engine. Write any three pollutants in exhaust gasses of petrol and diesel engine with their effects on environment. The following observations were made during the test on an oil engine BP of engine = 31.5 kW, fuel used = 10.5 kg/hr, C.V. of fuel = 43,000 kJ/kg, jacket circulating water = 540 kg/hr, rise in temperature of cooling water = 56°C, water circulated through exhaust gas calorimeter = 545 kg/hr, rise in temperature of water passing through exhaust gas calorimeter = 36°C, temperature of exhaust gas leaving the exhaust gas calorimeter = 82°C, A : F ratio = 19:1, ambient temperature = 17°C, Cp for exhaust gases = 1 kJ/kg°k. Draw up the heat balance sheet on minute basis. 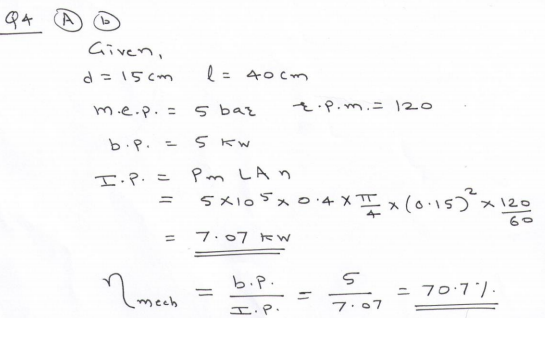 Describe the method to measure indicated power of I.C. engine. Define the following related I.C. engine. i) Indicated power ii) Brake power iii) Brake specific fuel consumption iv) Relative efficiency. 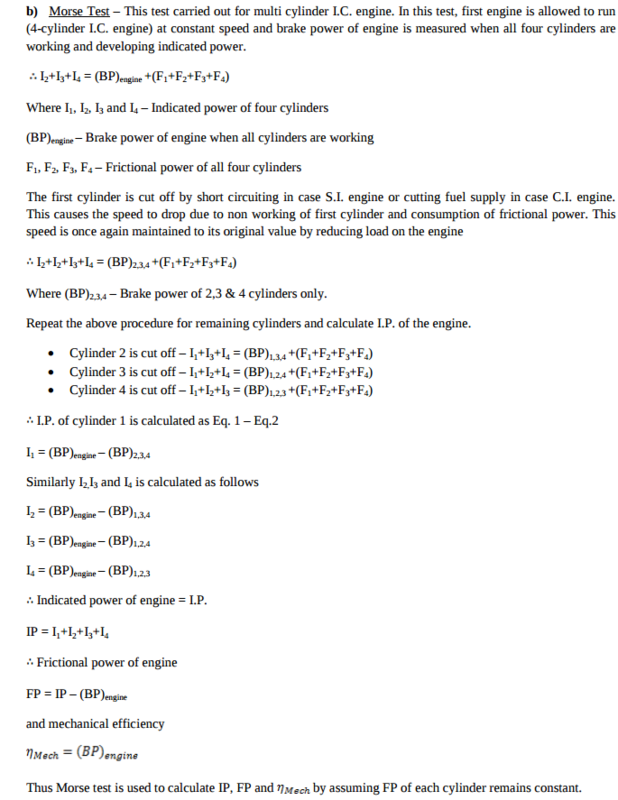 i) Indicated Power (ip) is defined as the power developed by combustion of fuel in the cylinder of engine. It is always more than brake power. ii Brake Power:-  The useful power which is available at the crank shaft is called as brake power.  It is denoted by “B.P.”  It has unit kW iii) B.S.F.C: It is the weight of fuel required to develop 1KW of the brake power for period of 1 hour. 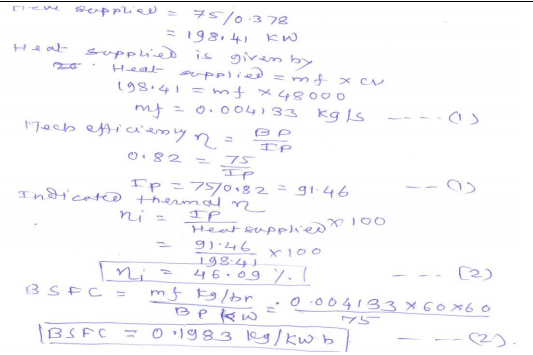 Unit of B.S.F.C is Kg/KWh. It is defined as the amount of fuel consumed per unit of break power developed per hour. 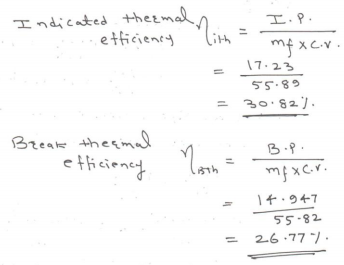 iv) Relative efficiency is defined as the ratio of indicated / brake thermal efficiency to the air standard efficiency. List the additives of Lubricant used in S.I. engine and state their advantages. Role of following lubricant additives (one mark each) 1. Zinc ditinophosphate: - Zinc ditinophosphate serves as an anti – oxidant and anticorrosive additive. 2. Fatty acids: - This type of additives prevents rusting of ferrous engine parts during and form acidic moisture accumulation during cold engine operation. 3. Organic Acids: - This type of additives improves the detergent action of lubricating oil. 4. Ester: - To lower the pour point of lubricating oil. 5. Silicon polymers: - This additive serves as Antifoam Agent. 6. Butylene polymers: - This type of additives added in lubricating oil to increase their viscosity index. 7. Zinc ditinophosphate: - Zinc ditinophosphate serves as an anti – oxidant and anticorrosive additive. 8. Fatty acids: - This type of additives prevents rusting of ferrous engine parts during and form acidic moisture accumulation during cold engine operation. 9. Organic Acids: - This type of additives improves the detergent action of lubricating oil. 10. Ester: - To lower the pour point of lubricating oil. 11. Silicon polymers: - This additive serves as Antifoam Agent. 12. Butylene polymers: - This type of additives added in lubricating oil to increase their viscosity index. Fig. shows construction of simple catalytic converter exhaust fan as it enters the converter all three pollutions namely HC CO and NOX oxidizes and reduce is to the component which are acceptable to the environment, This occurs due to chemical reaction and at 600 to 7000 c temperature. 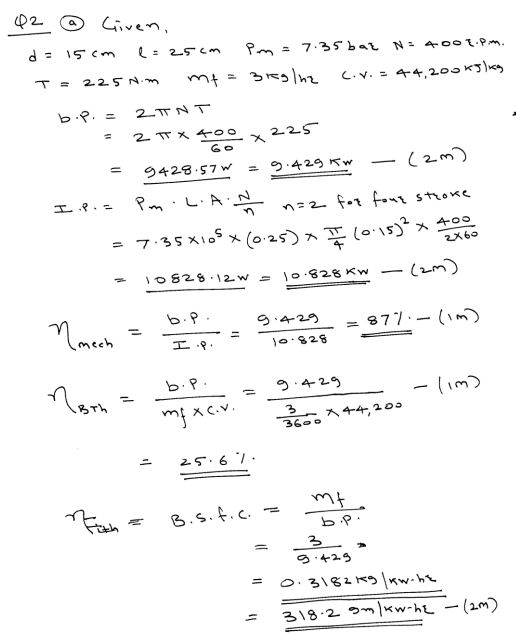 During a trial on 4-stroke gas engine following observations were recorded: Bore = 300 mm ; Speed = 200 rpm Stroke = 400 mm ; Gas used = 11.7 m3/h Number of explosions/min = 90 Gauge pressure of gas = 170 mm of water Barometer reading = 755 mm of Hg Mean effective pressure = 6 bar Calorific value of gas used = 21500 KJ/kg at N.T.P. Net load on brake = 2 KN Brake drum diameter = 1.2 m Ambient temperature = 27°C Calculate: (i) mechanical efficiency (ii0 brake thermal efficiency. The results of exhaust gas analysis for petrol engine running at full load and at constant speed are shown in Fig. No. 1. Label the exhaust gases (indicated by 1, 2, 3, 4). Which conclusion can be drawn from this figure. Various efficiencies of 4-stroke petrol engine run at full throttle over its speed range are plotted in Fig. No. 2. Label different efficiency curves (indicated by 1, 2, 3, 4). Which conclusion can be drawn from this figure. State the role of following lubricant additives: 1) zinc ditinophosphate 2) fatty acids 3) organic acids 4) ester 5) silicone polymers 6) butylene polymers. Role of following lubricant additives 1. Zinc ditinophosphate: - Zinc ditinophosphate serves as an anti – oxidant and anticorrosive additive. 2. Fatty acids: - This type of additives prevents rusting of ferrous engine parts during and form acidic moisture accumulation during cold engine operation. 3. Organic Acids: - This type of additives improves the detergent action of lubricating oil. 4. Ester: - To lower the pour point of lubricating oil. 5. Silicon polymers: - This additive serves as Antifoam Agent. 6. Butylene polymers: - This type of additives added in lubricating oil to increase their viscosity index. 1. Willan’s line method 2. Morse test 3. Motoring test 4. Difference between i.p. and b.p. Explain with neat sketch working principle of any one type of catalytic converter. Define : i) Brake thermal efficiency ii) BSFC related to I.C. Engine. 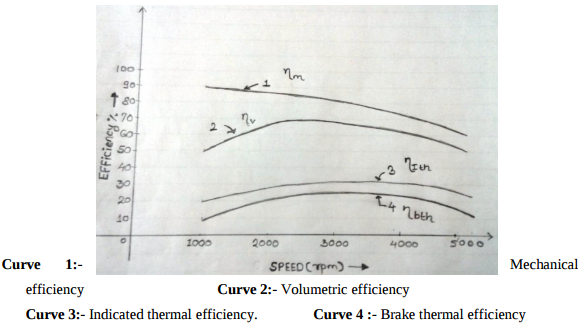 i) Brake thermal efficiency – It is defined as the ratio of heat equivalent to brake power per unit time to the heat supplied to the engine per unit time Brake thermal efficiency = B.P./ mf x C.V. 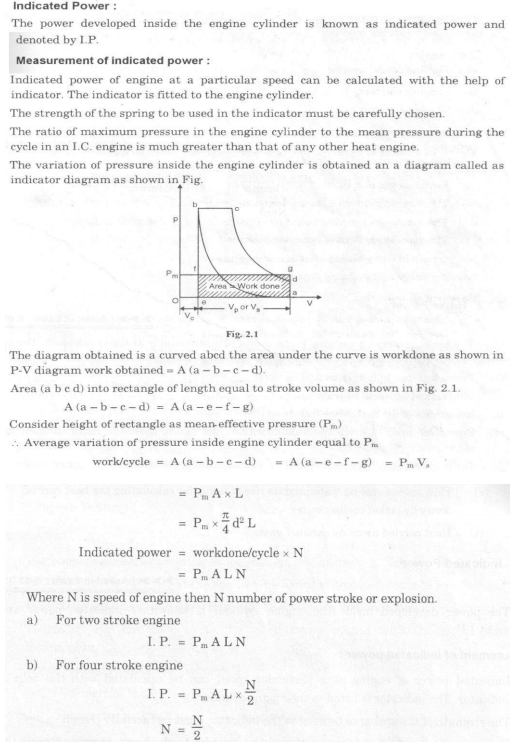 Following observations were recorded during a trial on single cylinder four stroke oil engine : Cylinder bore = 15 cm Length of stroke = 25 cm Mean effective pressure = 7.35 bar Engine speed = 400 rpm Brake torque = 225 N.m. Fuel consumption = 3 kg/hr Calorific value of fuel = 44200 kJ/kg. Determine : i) Mechanical efficiency ii) Brake thermal efficiency iii) Brake specific fuel consumption. 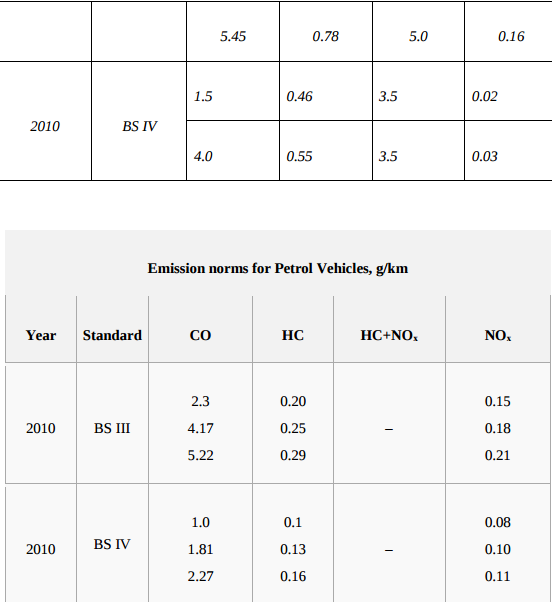 State effects of pollutants in exhaust gases of petrol engine. The major air pollutants emitted by petrol engines are CO2, CO, HC, NOx, SO2, smoke & lead vapour. Carbon monoxide combines with hemoglobin forming carboy hemoglobin, which reduces oxygen carrying capacity of blood. 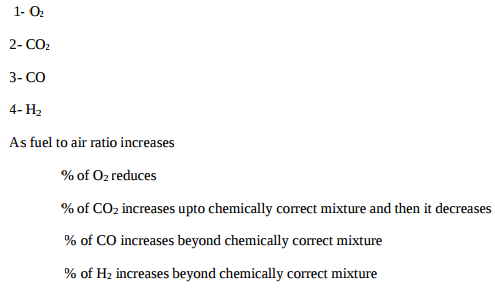 Effect of CO2: Causes respiratory disorder & suffocation. Effect of HC: 1. It has effect like reduced visibility, eye irritation, peculiar odour & damage to vegetation & acceleration the cracking of rubber products. 2. It induce cancer, affect DNA & cell growth are know a carcinogens. Define : i) Mechanical efficiency ii) Volumetric efficiency related to I.C. engine. i) Mechanical Efficiency- It is the ratio of the power available at the engine crankshaft (bp) to the power developed in the engine cylinder (ip). ii) Volumetric efficiency :- It is the ratio of the actual volume of the charge admitted into the cylinder to the swept volume of the piston . State advantages of closed cycle gas turbine. (i) It has higher thermal efficiency for the same minimum and maximum temperature limits and for the same pressure ratio. (ii) Since the heating is external, any kind of fuel even solid fuel having low calorific value may be used. (iii) There is no corrosion due to circulation of combustion product. (iv) As the system is a closed one there is no loss of the working fluid. (v) The size of the turbine will be smaller compared to an open cycle gas turbine of the same output. (vi) The regulation is more simple. (vii) The heat transmission coefficient in the exchanger is better due to the increase in suction pressure. (viii) Loss due to fluid friction is less due to higher Reynolds number. 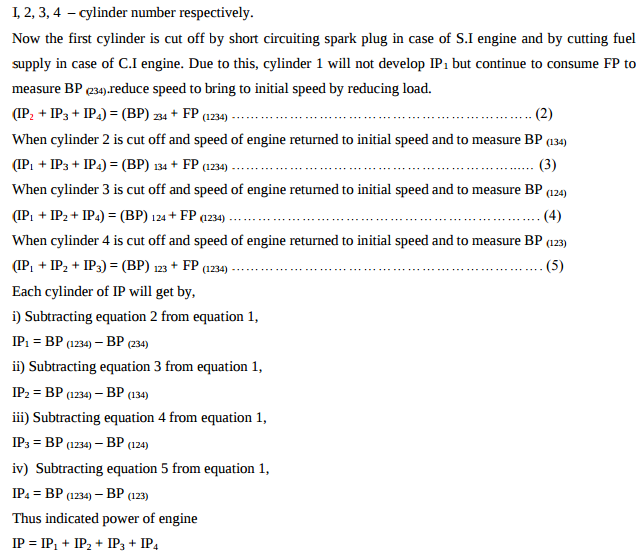 The following data is collected during a trial of four stroke four cylinder petrol engine. B.P. with all cylinders working = 14.7 kW B.P. with cylinder no. 1 cut off = 10.14 kW B.P. with cylinder no. 2 cut off = 10.3 kW B.P. with cylinder no. 3 cut off = 10.36 kW B.P. 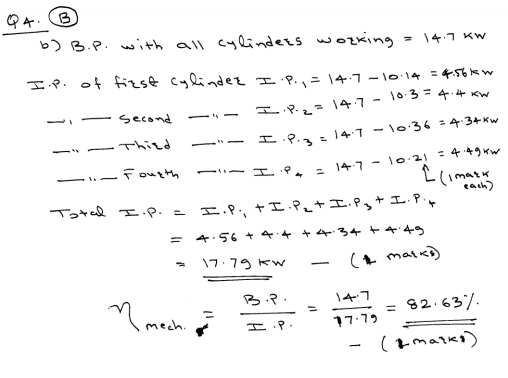 with cylinder no. 4 cut off = 10.21 kW Find mechanical efficiency of engine. State any four types of sensors used in I.C. engine. Following sensors are used in ECU: A permanent magnet inductive signal generator is mounted in close proximity to the flywheel, where it radiates a magnetic field. As the flywheel spins and the pins are rotated in the magnetic field, an alternating (AC) waveform is delivered to the ECM to indicate speed of rotation. Air Flow Sensor (AFS): The AFS is normally located between the air filter and the throttle body. As air flows through the sensor, it deflects a vane (flap) which wipes a potentiometer resistance track and so varies the resistance of the track and generates a variable voltage signal. Manifold absolute pressure (MAP) sensor: The MAP sensor measures the manifold vacuum or pressure, and uses a transducer to convert the signal to an electrical signal which is returned to the ECM. The unit may be designed as an independent sensor that is located in the engine compartment or integral with the ECM. Coolant temperature sensor (CTS): The CTS is a two-wire thermistor that measures the coolant temperature. The CTS is immersed in the engine coolant, and contains a variable resistor that usually operates on the NTC principle. Throttle Position Sensor (TPS): TPS is provided to inform the ECM of idle position, deceleration, rate of acceleration and wide-open throttle (WOT) conditions. The TPS is a potentiometer which varies the resistance and voltage of the signal returned to the ECM.